At the invitation of State Councilor and Foreign Minister Wang Yi, Japanese Foreign Minister Taro Kono will pay an official visit to China from April 13 to 15. During this visit, State Councilor and Foreign Minister Wang Yi and Foreign Minister Kono will co-chair the fifth High-level Economic Dialogue between China and Japan. Senior economic officials of both countries will attend the event. The two sides will also attend the opening ceremony of the China-Japan Youth Exchange Year. Q: The Malaysian Prime Minister's Office just released a statement saying that with the concerted efforts of the Malaysian and Chinese governments and companies, companies on the two sides have signed a supplementary agreement that will pave the way for the resumption of the East Coast Rail Link (ECRL) project. What is your comment? A: China and Malaysia are neighbors that enjoy traditional friendship and important partners for cooperation. Both sides attach great importance to such friendship and cooperation. The governments of Malaysia and China as well as the companies involved have been in close communication for the relevant project. We are glad that after friendly consultations, the two sides have reached a solution. We hope the construction of the project can be resumed at an early date for more win-win outcomes. 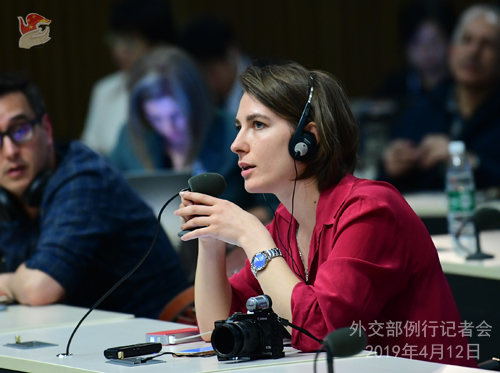 Q: First, lately some Australian media have been accusing China of intimidating Professor Brady of Canterbury University, New Zealand, claiming Chinese security services were suspectedly involved in her burglary cases. On April 9, New Zealand Prime Minister Ardern in an interview said such claims were "completely wrong" and that she received no advice identifying the involvement of any Chinese security service. Do you have any comment? Second, we noted that Alicia Bárcena, Executive Secretary of the UN Economic Commission for Latin America and the Caribbean (ECLAC) said that the Belt and Road Initiative proposed by China is a initiative for international cooperation with deep insight. As the Second Belt and Road Forum for International Cooperation is just around the corner, how do you understand the prospect for international organizations' participation in the Belt and Road? A: We have noticed these reports and the remarks by Prime Minister Ardern. This fully proves that certain Australian media's attacks against China are just baseless rumors. Such ploys to smear China could barely stand up to any scrutiny. Any unbiased person will make a responsible judgment. Once again we advise certain media in Australia to honor professional ethics, stop making irresponsible comments, and instead, contribute to mutual trust and friendship between countries. Regarding your second question, the recognition and support for the Belt and Road Initiative are now becoming the mainstream among the international community. Now, 125 countries and 29 international organizations have signed BRI cooperation documents with China. The effective complementarity between the Belt and Road Initiative and the UN 2030 Agenda for Sustainable Development has formed a policy synergy to promote global common development. UN Secretary-General Antonio Guterres said on many occasions, including the time when he was visiting China last September, that the UN agrees with and supports the Belt and Road Initiative and that it is of great significance to the UN's goal of reducing the poverty population globally. UN High Commissioner for Refugees Filippo Grandi said that the Belt and Road Initiative is a positive initiative to the UN and he hopes that China will inspire more countries to get on the path towards prosperity and stability. Heads of UN bodies, including Executive Director of the UN Children's Fund (UNICEF) and the Executive Director of the World Food Programme (WFP), also commended the Belt and Road Initiative. Under the BRI, we are ready to work with other participants to enhance regional interconnectivity, promote world economic growth, address global challenges and achieve common prosperity. Q: When meeting with ROK President Moon Jae-in in the White House, US President Trump said that he would be open to a third summit meeting with DPRK's Supreme Leader Kim Jong-un and a step-by-step plan to achieve denuclearization. He also said he had decided not to impose additional sanctions on Pyongyang, but current sanctions will continue. What is your comment on President Trump's statements? My second question is that DPRK's Supreme Leader Kim Jong-un was re-elected as Chairman of the State Affairs Commission. There are some changes of posts at the senior level. What is your comment? A: We have noted that during his visit to the US, ROK President Moon Jae-in exchanged views with US President Trump on the Korean Peninsula situation. We believe that it serves the common interests of all parties and meets the shared aspirations of the international community to sustain the momentum for dialogue to further ease the situation and move forward peace talks. We have talked about it many times and I would like to repeat it here that China hopes all relevant parties will stick to the right path of solving the problem through dialogues, step up engagement, take phased and synchronized steps as part of a package plan, respect and accommodate each other's legitimate concerns, strive to narrow differences and expand consensus, and work together to advance the denuclearization of the Korean Peninsula and the political settlement of the Korean Peninsula issue. We believe that the US side has sent out positive messages when they say they will continue dialogue and do not wish to increase sanctions. We hope that the momentum for dialogue on the Korean Peninsula issue will be sustained and consolidated. As for your second question, you may have noticed that President Xi Jinping has sent a congratulatory message to Kim Jong-un on his re-election as Chairman of the State Affairs Commission. Q: Just a follow-up question on Malaysia's East Coast Railway project. Can you shed any light on what China may have offered Malaysia in order to get that agreement? A: I think I have made it very clear that the governments and businesses of China and Malaysia have reached relevant consensus and signed an agreement in the spirit of mutual respect and equal consultation, which is conducive to both sides. Regarding the specifics, as this is a matter of cooperation between businesses, I'd refer you to the relevant parties. Regarding whether China has offered Malaysia anything in exchange for the agreement as you asked, there is no such offering at all. Q: A military coup unfolded in Sudan. The Sudanese Defense Ministry said that President Omar al-Bashir was arrested. What's China's view on the situation in Sudan? A: We have been closely following the development of the situation in Sudan. As you all know, non-interference in other countries' internal affairs is our consistent principle. We believe that the Sudanese side is capable of managing its own internal affairs and ensuring its national peace and stability. Traditional friendship runs deep between our two countries and peoples. No matter how the situation may evolve in Sudan, we will remain committed to upholding and developing friendly and cooperative ties. Q: The USS Wasp is conducting military drills with the Philippines in the South China Sea. What's the Foreign Ministry's response to this? A: Perhaps you were not here the day I answered this question. The South China Sea itself is a peaceful place. Countries in the region have been working together to safeguard regional peace and stability by resolving or managing disagreements though friendly consultation and coordination between countries directly concerned. We hope non-regional states will refrain from stirring up trouble in the calm waters of the South China Sea. Q: Does China recognize the military council in Sudan? What role does it intend to play in helping maintain social stability in Sudan? With major investment in the country, is China worried that its interests will be harmed? 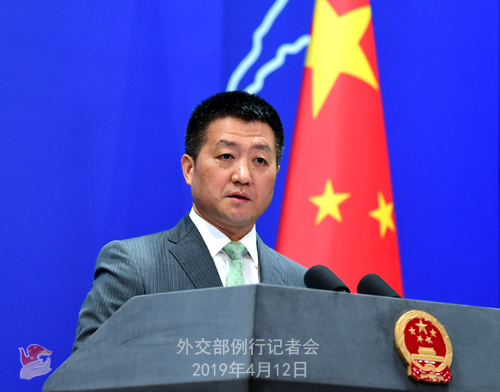 A: Just as I said earlier, and as I believe you are well aware of, China's position is very clear: we are committed to non-interference in other countries' internal affairs. On the latest situation in Sudan, as I said, we believe that the Sudanese side is capable of managing its own internal affairs and ensuring its national peace and stability. As to the Chinese investment and other interests in Sudan that you referred to, I'd like to point out that, over the years, the bilateral relations between China and Sudan have enjoyed sound development and our mutually-beneficial cooperation has delivered benefits to both peoples. We share a deep friendship. No matter how the situation may evolve in Sudan, we will remain committed to upholding and developing friendly and cooperative ties. Q: Several years ago President Xi Jinping referred to Bashir as an old friend. Is China concerned that its old friend has been overthrown by Sudan's military? Does China plan on offering its old friend any material support? Also, there are a lot of protesters now on the streets defying curfews which is a potentially dangerous situation. Where does China stand on that current situation? A: Regarding your first question, like I said, China and Sudan enjoy traditional friendship. In our decades-long friendly relations, we have maintained friendly exchanges with Sudan's government, its all walks of life and the Sudanese people. As for your second question, I would like to reiterate that we believe Sudan has the capability to properly handle its internal affairs. Q: What's your expectation for Japanese Foreign Minister Taro Kono's upcoming visit to China? A: China and Japan are each other's important close neighbors. The bilateral relations between the two countries maintain the momentum of improvement and development. China attaches importance to Foreign Minister Kono's visit to China. State Councilor and Foreign Minister Wang Yi will hold a talk with him and the two sides will exchange views on China-Japan relations and international and regional issues of mutual interest. They will co-chair the 5th China-Japan High-level Economic Dialogue, during which more than ten government officials from the two countries will have an in-depth discussion on a wide range of topics including our macro-economic policies, bilateral economic relations and trade, third-market cooperation and innovative ways of cooperation, and explore more cooperation opportunities. China stands ready to work with Japan to implement the consensus on improving China-Japan relationship reached by the leaders of the two countries, jointly plan for the exchanges at various levels and across-the-board practical cooperation going forward, properly resolve relevant issues and promote the sound and steady development of China-Japan relations. Q: What is the reaction of the Chinese government toward Julian Assange's arrest? A: The Chinese side noted the relevant reports and hopes that parties will properly resolve this issue through friendly consultation. Q: The newly installed World Bank President on Thursday urged caution with the loans from China, citing the high buildup of debt, especially across the nations in Africa. He also pushed for more transparency in cooperation between China and Africa. What is your response? A: China's mutually beneficial cooperation with other countries under the Belt and Road Initiative, including that with African countries as you mentioned, is carried out following the principle of openness and transparency and on the basis of mutual respect, equality and mutual benefit through friendly consultation. As to whether such cooperation will add debt burdens for the partners, we already took similar questions on many occasions earlier. I wonder whether the relevant party is able to provide any solid evidence proving that the debt crisis in any country is attributed to its cooperation with China? But no such evidence has been offered to us by far. 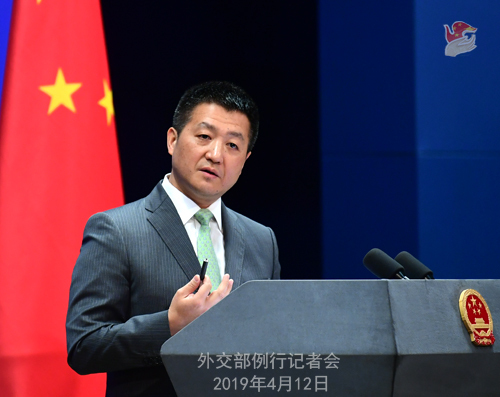 On the contrary, on this podium, we have come forward with solid evidence that slapped back the doubts of relevant parties and proved that the debts in the countries they identified are not caused by their cooperation with China at all. Instead, the debts incurred because some other countries caused a bigger proportion of their debts. Q: Regarding Julian Assange, you just said that China hopes the relevant parties are able to resolve this situation. Does China regard extraditing Mr. Assange to the US as a good way of resolving this situation? A: This issue indeed needs to be resolved through friendly consultation by all relevant parties. Q: Regarding the railway deal with Malaysia, does this represent that China is making adjustments in the BRI agreements for relevant countries? A: I cannot understand what you meant by saying there were adjustments. The Belt and Road cooperation between China and other countries follows the principle of consultation and cooperation for shared benefits. On the basis of mutual respect and equal-footed consultation, we reach mutually acceptable arrangements with other countries. There is no fixed pattern. The same is true with Malaysia. Some may say there have been some differences between China and Malaysia recently. Now facts have proven that our two sides can resolved differences through friendly consultations. The Ministry of Foreign Affairs and the municipal government of Tianjin will hold a promotion event presenting Tianjin to the world at 3:30 PM on April 16 in the South Building of the MFA. The theme of the event will be China in the New Era: A Dynamic Tianjin Going Global. Member of the Political Bureau of the CPC Central Committee and Secretary of the CPC Tianjin Municipal Committee Li Hongzhong will attend the event and deliver a speech, State Councilor and Foreign Minister Wang Yi will address the event, and Mayor of Tianjin Zhang Guoqing will promote the city. Representatives of foreign diplomats in China will be invited to speak and interact with the guests. This promotion event will be the first ever held for a municipality directly under the central government. Tianjin, one of the cradles of China's modern industry, has made important contributions to the country's economic and social development over the past 70 years. At the beginning of a new era, Tianjin, following a new development concept, is deepening implementation of the Beijing-Tianjin-Hebei coordinated development strategy, seeking integration into the Belt and Road Initiative and striving to build an open, inclusive and livable metropolis. The promotion event will showcase the city's inclusive historic culture and demonstrate its burgeoning exploration in pursuing high-quality development through self-driven innovation. Your active participation and coverage will be most welcome. With this MFA Tianjin promotion event scheduled, the MFA regular press conference will be adjourned for Tuesday, April 16, and be resumed on Wednesday, April 17. In the meantime, you may fax or email your questions to the Office of the Spokesperson as usual.